Successfully Added All Terrain 4.3 Inch Motorcycle GPS Navigation System 'Rage' -IPX7 Rating, 4GB Internal Memory, Bluetooth (Black) to your Shopping Cart. 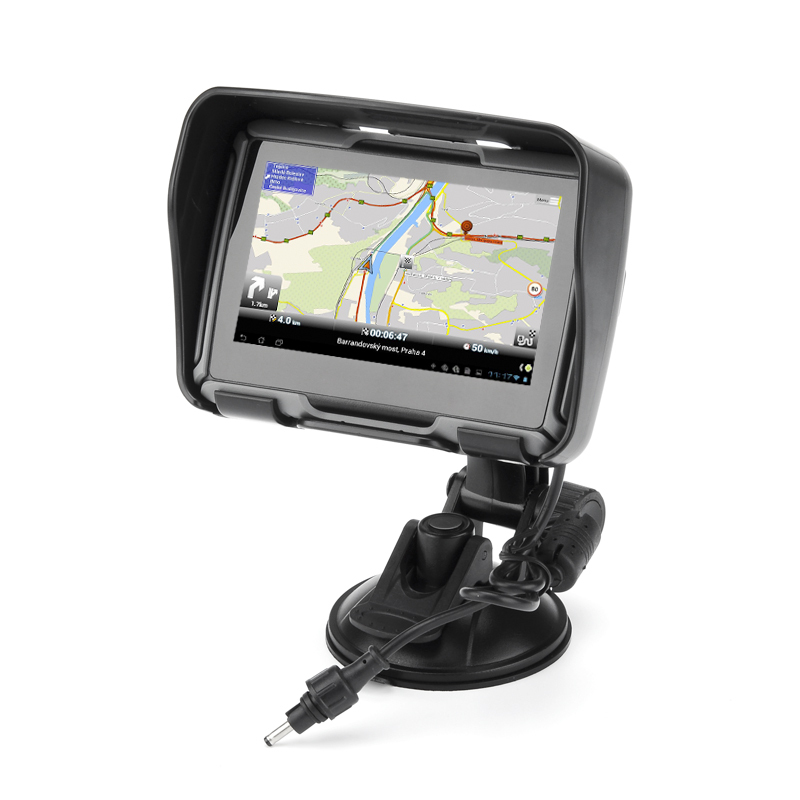 This All Terrain 4.3 Inch Motorcycle GPS Navigation System has an IPX7 Rating, 4GB Internal Memory and Bluetooth. Now arriving in black, the Rage GPS motorcycle navigation system, which can also be used with cars as well, is now available. 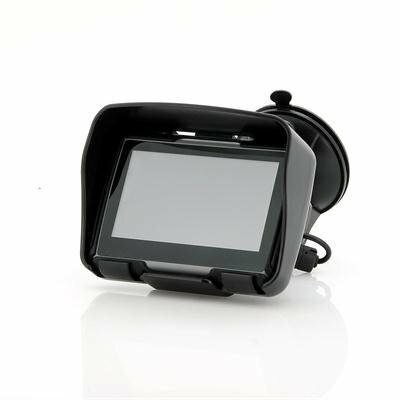 This Motorcycle GPS features a 4.3 inch touch screen that provides a user friendly interface in addition two power cables to be connected either to a car’s cigarette lighter receptacle port or a motorcycle battery. Furthermore, as part of the ‘Rage’ package there is a suction mount that can be used to place this GPS on your windscreen or you can opt to use the mounting bracket fixture to connect to the handlebar of your motorcycle for better viewing when riding on the highway. The IPX7 waterproof rating that this GPS unit has means it has been tested by being immersed in water of up to 1 meter in depth for 30 minutes so when you are out in the extreme weather you won’t have to worry about this device failing. Even if the ‘Rage’ falls into a creek or shallow river then the ingress protection design results in this GPS navigation system still being able to survive and work. For a safer and more convenient way to ride, this well rounded GPS navigator has Bluetooth connectivity to allow for hands-free plus it also has echo-cancellation. Available in our warehouse now, order yours now and start making your life just a little bit easier. Direct from the best source in electronic rear view mirrors and parking accessories, Chinavasion. Feels very solid and well protected. Good variety of accessories included. Cradle mount is strong and rigid. Accepts several GPS programs (if you can find a reliable working version). On my wish list would be if the basic WinCE installed can take more WinCE third party programs - and if the internal memory was big enough to hold at least one GPS program instead of relying on the micro SD card. Difficult to push down the power button. Constant wear on micro SD slot while programming because it seems most people take multiple attempts to get the GPS software installed and configured. My slot for the micro SD card has failed an no longer holds the card. It springs back out. The gap around the USB port is so close to the socket that many USB cables will not seat deep enough to make contact if the plastic end of the cable is too thick. You can shave a bit off the sides of the end to make it narrower or try another brand of cable. I really want to like this device but I do not recommend it to anyone who does not have the patience or capacity to source online, install and configure their own GPS software - possibly many times until you are satisfied with your setup. First time ordering through Chinavasion, and although I put my order in right in the middle of teh Chinese New Year, it was shipped and delivered the following week. Good service, and would have no concerns using Chinavasion again. On to the GPS unit, and more than satisfied with it so far. Although it comes with no navigation software or maps (you'll need to sort this out for yourself), once set up the unit got a satellite lock straight away, and RAM/hardware is such that it can cope with TTS and other functions easily. Happy enough with the power supplies and car suction mount, have a more robust RAM mount for the bike (which cradle fits as mounting holes match up fine). Overall, great value waterproof GPS for bike and car (compared to the usual brand suspects) as long as you don't mind sorting out nav software/maps for yourself. Not tried bluetooth as yet but no reason to expect any issues. Only slight negative is that the top screen layer can bubble and separate a bit if units gets too warm, and the screen can be hard to see in direct bright conditions. But I knew this before buying and can definitely live with it given the value. Great, easy and fast transaction very professional Rate an A+++. Thanks !